Basketball in the South Pacific is having trouble to keep its best prospect on the court. Why? Because it's so much easier to play rugby or US football. Many pacific countries are good in those sports like Fiji, Tonga or Samoa. Unfortunatly some great oceania prospects chose US football over basketball. Here is the stroy of Mel Purcell, best U18 player of American Samoa in 2002 and who's playing football in Hawaii University now. Like many youngsters from the South Pacific Mel Purcell (196-F-84) is strong, a rugby-like player. He was born in 1984 in Pago-Pago, capital city of the American Samoa. He went to school at Leone High School, one of the best school in sports of country. There he played basketball, track&field, volleyball and US football. 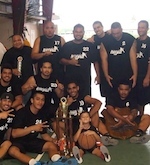 All-around sportman, he was selected in the U18 American Samoa squad to play the OBC Youth Tournament 2002 in Tonga. Fiji claimed the gold medal over Australia but Purcell did make his mark during this tournament averaging 26.1pts per game, he also scored a tournament-high with 46pts against Tahiti. Am Samoa ended 5th. When he graduated at Leone HS, he had to choose what to do next. He was 193cm tall at the time, he was all-star and MVP in the amsam schoolastic league but he didn't get many good offers from basketball programs. He's related to former NFL-player Alvis Satele, Satele made him join the US. There he received offers from Oregon, Fresno State, Western Kentucky and Hawaii. All offers were football ones. He decided to commit to Hawaii University, a good choice for a pacific kid. He sat out during all the 2002-03 season in order to meet the year residency requirement for eligibility. He made his NCAA debut in 2003-04 with 11 games, coming out of the bench. This season he should be the starting defensive end, he'll team up with his cousin Samson Satele, Alvis's son. He has growth to 196cm and 117kg. Purcell's story is not a stand-alone one. Only at Hawaii University there is two other amsam players. Larry Sauafea (188cm, 122kg, 24/04/1985) who graduated from Samoana high-school in 2003, he played two years of basketball, and Keith Ah Soon (187cm, 120kg, 26/08/1986) who just graduated for Tafuna HS in 2004, he also played basketball in high-school. I don't think we can't prevent this kids to leave for US football, they might become better football player then basketball player but it's still quite sad to see prospects like Purcell quitting the basketball courts.